Perivoli Estate, meaning orchard, is one of the most significant estates in Kambos. 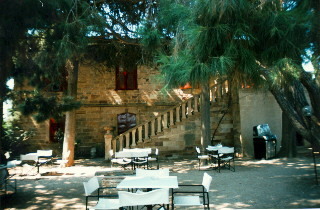 The main building consists of two floors whilst it was constructed exclusively from the ochre-yellow stone from Thymiana, Chios. The stairway leading to the upper floor is a work of art with its elaborately engraved columns and stone handrail. The magnificent eclectic-style main gate is also an element of exceptional interest. In the pebble-paved yard, one can find a well and a cistern. There is also an auxiliary edifice inside the building. The mansion, like most Kambos buildings, was reconstructed following the 1881 earthquake. The main building in addition to the auxiliary, were restored between 1979 and 1980. Since 1982, the lodge maintains a 24-bed capacity to house visitors. The Ministerial Decree of 1990 characterized the main building, reservoir, well, fountain, pebble-paved yard and wall surrounding the estate together with Odysseus Xydas’ orchard were all identified as historical and preserved monuments.